While the study of agriculture was once mostly limited to land-grant universities, an increasing number of institutions of higher learning, both private and public, large and small are now addressing this subject with a sustainability bent. The Center for Regional Food Systems at Michigan State University in East Lansing, Mich. aims to partner with entities around the state to advance the objectives of the Michigan Good Food Charter www.michiganfood.org, a policy that outlines a statewide vision centered on good food and rooted in local communities. The center engages Michiganders and people outside Michigan in education, research and outreach to develop regional and sustainable food systems. In Missoula, Montana, undergraduate and graduate students may choose to emphasize sustainable food and farming through the university’s environmental studies program. Students who choose this emphasis learn about food systems, work on an urban farm to help grow organic food for low-income people, participate in research and engage with the community. Stockbridge School of Agriculture at the University of Massachusetts Amherst offers a Bachelor of Science degree in sustainable food and farming, which happens to be the fastest-growing major in the school. 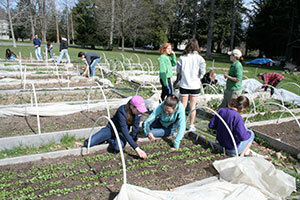 The major focuses on hands-on practice and experiential learning. The Student Farming Enterprise Project requires students to manage a small organic farm and sell food through a CSA and farmers’ market. The Sustainable Food & Agriculture Program at Williams College in Williamsport, Massachusetts teaches about food sustainability, centering on national and international food and farming issues. Dining Services at the college has partnered with regional farms Peace Valley Farm and High Lawn Farm and the Western Massachusetts Food Processing Center to supply student dining halls with regional agricultural products. Merry Lea Environmental Learning Center of Indiana’s Goshen College operates an educational farm to demonstrate sustainable agriculture practices for its students and visitors. A research project with Savanna Institute has established a woody perennial polyculture area of planting―the goal is to exhibit how crops and animals may be raised together in a diverse and perennial farming system. In Tempe, Arizona, Arizona State University’s School of Sustainability is the first in the United States to grant comprehensive degrees in sustainability. Part of the Julie Ann Wrigley Global Institute of Sustainability at Arizona State, the school offers bachelor’s, master’s and doctoral degrees in sustainability. In a cross-disciplinary approach, programs focus on food and food systems, water quality, international development, social transformations and more. The Berry Center, named for famed writer and Kentuckian Wendell Berry, is located in New Castle, Kentucky and is part of St. Catharine College. A stated goal of The Berry Center is to change America’s agriculture systems so that nature is the standard, with no damage to the environment. This year, the center welcomed its first students, who are pursuing bachelor’s degrees in farming and ecological agrarianism and are learning about ecosystems-based farming through experience and literature. Washington State University’s Center for Sustaining Agriculture and Natural Resources in Pullman, Washington, is a research center addressing sustainability issues in agriculture, including climate change and energy and water security. Its numerous program areas included biologically intensive agriculture and organic farming, small farms, waste to fuels and organic agriculture. In addition to offering a graduate certificate in sustainable agriculture, students may also earn undergraduate and graduate degrees in a variety of programs through the center. In Blacksburg, Virginia, Virginia Tech University students can minor in Civic Agriculture and Food Systems through the College of Agriculture and Life Sciences. With a core study of sustainable food and agriculture, the curriculum is designed around food security and sovereignty, civic engagement, local economies, ecological stewardship, health, collaborative teaching and experiential learning. The minor is open to students from all degree programs. Its numerous community partners include Glade Road Growing, Hale YMCA Community Gardens and Heifer International. The Kansas Center for Sustainable Agriculture and Alternative Crops at Kansas State University in Manhattan, Kansas was established in 2000 due to concern about the survival of small farms in the state. The center is a hub for research and education regarding sustainable agriculture, alternative crops and lowering farming input costs through sustainable practices. It assists farmers and ranchers in improving sustainability and profitability and protecting natural resources. Yale University, located in New Haven, Connecticut, runs the Yale Sustainable Food Project. The project emphasizes connections between people, land and food, and manages two on-campus farms. A summer internship makes available work opportunities for students to learn about food production, local food systems and sustainable agriculture. Yale offers over 20 courses on food and agriculture every semester, teaching over 1,000 students. One of the Sustainable Food Project’s goals is to incorporate food and agriculture into the studies of both undergraduate and graduate students. Located in Edmonton, Alberta, the University of Alberta has a Department of Renewable Resources, part of the Faculty of Agricultural, Life & Environmental Sciences. Undergraduates may study sustainable agriculture, land reclamation, conservation biology and forestry. Research in environmentally sustainable agriculture is focused on soil and water conservation, maintaining organic matter in soil, forestry and climate change. The department also sponsors the Bentley Lecture in Sustainable Agriculture.